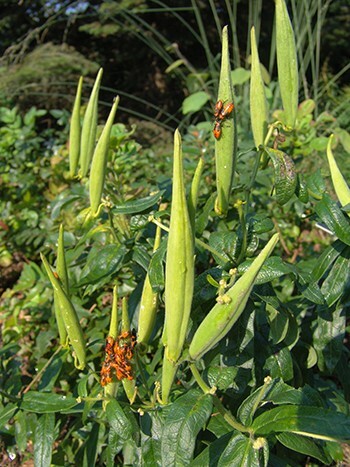 Strolling in the garden at this time of year, you might be surprised to find your Asclepias spp. (milkweed) infested with orange- and black-spotted bugs. 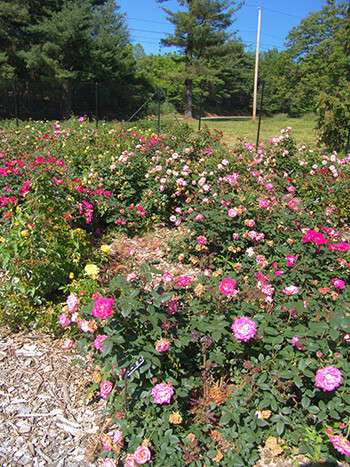 Often seen in groups of a dozen or more, they can be a shocking sight to gardeners. 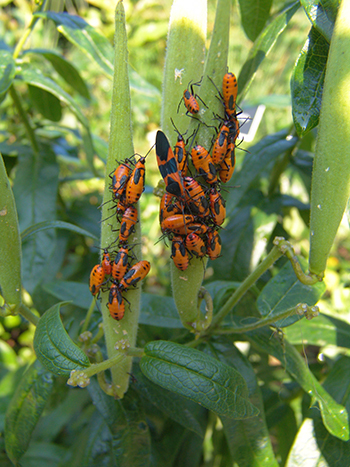 No need to worry: Oncopeltus fasciatus, the milkweed bug, causes minimal damage to plants. This time of year, all stages of these insects’ lifecycles can be found on Asclepias seed pods. Adults typically live a month during the summer, with females laying over 2,000 eggs in a lifetime. These eggs are placed in the milkweed seedpods or in crevices between pods. Nymphs lack the full wings of adults, and are mostly red with black antennae and a few black spots. Throughout growth, these black spots develop as do wing pads. This true bug (order: Hemiptera) is more of a nuisance than a threat, feeding on the seed, leaves, and stems of milkweed. Most gardeners live with the minimal damage caused by these orange beauties because it lasts for such a short time. They can be controlled by removing leaf litter and spent stalks in the fall as this is where the adults overwinter. While one could use insecticidal soaps to eliminate milkweeds bugs, this is a poor method because any soap used will also prevent butterflies from living on the plant. Monarchs butterflies cannot survive without milkweed; their caterpillars eat only milkweed (Asclepias spp. ), and adults need milkweed to lay their eggs. Enjoy the colorful bug display for the month!